James Pethokoukis is the latest conservative to demand that Treasury Secretary Tim Geithner resign. Finally, something left and right can agree about! Lefties all hate Geithner too. 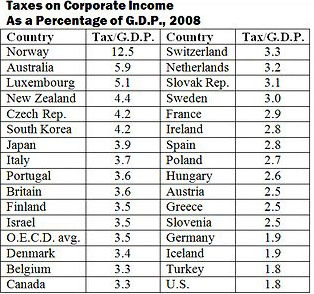 The Obama-Geithner plan would lower the statutory corporate tax rate to 28 percent from 35 percent….So instead of having the second highest corporate tax rate in the world, the United States would probably be fourth behind Japan, France, and Belgium…. To pay for the lower tax rate, Obama would eliminate “dozens of tax loopholes and subsidies”….Obama and Geithner apparently still don’t understand how harmful corporate taxes are….Obama and Geithner apparently still don’t understand who bears the burden of corporate taxes. It’s workers….Obama and Geithner would take the top individual tax rate to 40 percent, leaving a 12 percentage-point gap with the corporate tax rate. This creates a huge incentive for tax sheltering. done combing the tax code for deductions and loopholes. The former is one of the highest in the world. That latter has been falling for years and is now one of the lowest. That’s right! The actual federal income tax paid by corporations is one of the lowest in the world. Even if you think statutory rates are more important, surely this is germane to the conversation? I say this as someone who’s on record as favoring a complete abolition of the corporate income tax — primarily because tax receipts from corporations are so low that I’m not sure they’re worth the bother anymore. Of course, I also acknowledge the need to make up the revenue elsewhere, since I don’t believe the supply-side fairy will magically do this for us. This would indeed create tax sheltering issues that might be insurmountable. Or might not. But in any case, you need to make up the revenue. It won’t happen automatically, no matter how often Arthur Laffer pretends it will. UPDATE: Pethokoukis hauls out several strained studies that try to prove American corporations actually pay some of the highest taxes in the world. Sorry. The only way to do an apples-to-apples comparison is to look at corporate tax revenue as a percent of GDP and to let a neutral party apply a consistent methodology. The OECD does exactly that every year. 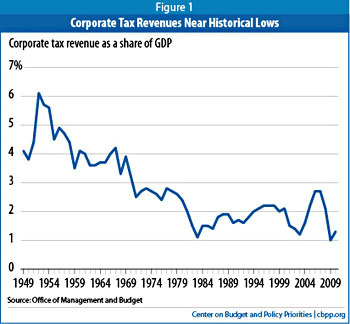 Here’s a chart showing the corporate tax burden from 1982 through 2005. The United States is a little below the middle of the pack. And here’s their latest chart. 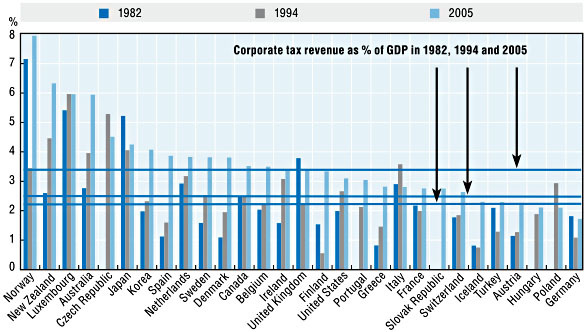 Our corporate tax burden has fallen dramatically since 2005, and if you read all the way to the end you’ll now find the United States at the very bottom.